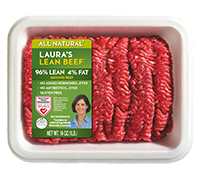 The USDA allows beef to be labeled "natural" as long as it is minimally processed and contains no artificial ingredients. That definition covers most fresh beef sold in grocery stores. 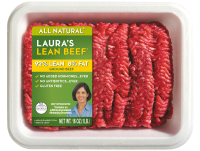 So what exactly makes Laura's Lean different? You might think of the Laura's program as a return to traditional, old-fashioned cattle farming. Unlike most other "natural" beef, our approach begins with the way the cattle are raised, without the use of antibiotics or growth hormones. You'll see this stated on the label. In addition, the cattle are raised on a vegetarian diet of natural grasses and grains - they are never fed animal by-products. And of course, no additives, fillers, or artificial ingredients are used in our beef. 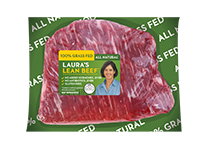 Select all natural beef and chicken products are available on our online store.